This is really good, puddin! WELL DONE Puddin, And what can I say...Another Fave...Hay Mark!! 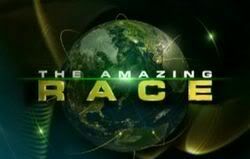 Reality Heaven: Were your decisions to tryout for Amazing Race 13, spur of the moment or did you mull this idea over for a time, before submitting for the competition? Mark: We had been trying out for at least ten seasons. We love the show, and had been trying to get on for a LOOOOONG time. We made some seriously lame submission tapes until we realizes we should stop trying to be clever, and jsut be ourselves. Bill: I think when we first applied for The Amazing Race, it was kind of spur of the moment (and the first tape we made was truly crappy). But after that, we did think about how we should present ourselves. Going down to the Open Casting line was a bit spur of the moment, though — it was cold, rainy, and windy that Saturday morning, and getting up at five a.m. wasn’t easy. But we’re very glad we did! Reality Heaven: Since you wear “geek like a badge” can you tell us why this is a positive experience for you? Mark: Are you kidding? We get the chance to get up there and show people that geeks can compete. To many people think geeks are the stereotypical living in their parents basement, unwashed, arguing over lines of Star Wars dialog simplifications you see in the media too, too often. I say everyone is a geek about something. We’re just geeky about computers, games, comics, toys, etc… I really admire people like Kynt and Vyxsin, who say “Hey, this is who we are”, and you either deal with it or move on. I’m that way too, just with less hair, and no fashion sense. 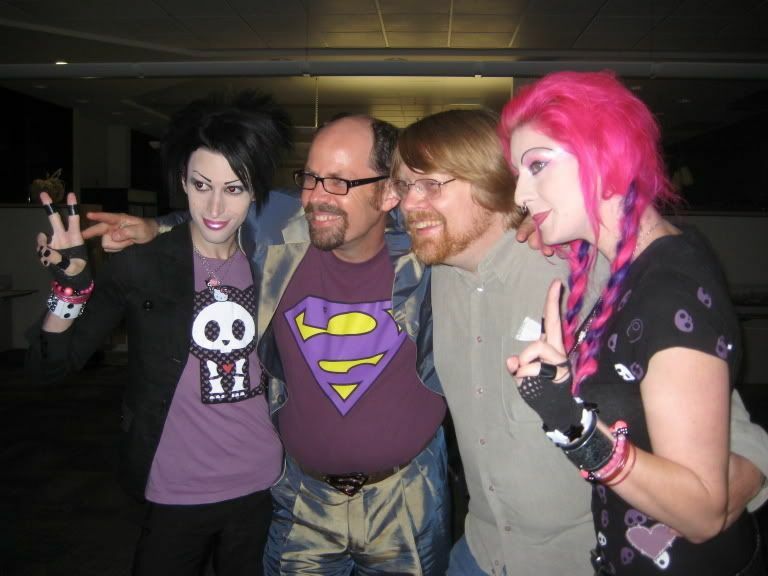 Bill: Like Mark said, there are all kinds of geeks. And all it really means is that you really love doing a thing. We love comics and games and technology, and that game geek part of us got to participate in one of the most incredible competitions ever. How cool is that? Reality Heaven: What was your motivation? The prize? The experience? The competition? All of these? Mark: Bill and I both wanted, more than anything else, to play the game. We’re gamers at heart, and this was the chance to play a once in a lifetime game. Plus I wanted a Amazing Race fannypack. Those things are Stylish! Bill: Definitely. We wanted all of those things, but more than anything, we wanted to play. They have taken an oath of reality-TV silence, so local “Amazing Race” contestants Mark Yturralde and Bill Kahler can't say whether they won or lost, or even how they played the game. But you can be pretty sure that when the self-described Comic-Con geeks ran their final race earlier this year, they were wearing the right underwear for the job. “I very clearly remember a discussion we had about underwear that went on for 90 minutes, where we argued about what type of underwear we should get and what the underwear should be made out of and how many pairs we would need,” Yturralde said last week. Gee, Mark, you guys are pretty geeky, aren't you? “You have no idea,” Yturralde said. Well, now we do. And come this weekend, so will everybody else. Yturralde and Kahler make up one of 11 teams competing in the 13th edition of “The Amazing Race,” the globe-trotting CBS competitive reality show that returns to prime time Sunday. For this installment, the series sent its contestants on a 23-day journey that covered five continents, making stops in Cambodia and Kazakhstan and taking in a floating city along the way. As always, the details are under wraps. But no matter where the racers ended up, seasoned “Amazing Race” watchers know they were met with exhausting physical challenges involving heights and perhaps bungee jumping, weird food, hairy taxi rides to far-flung airports and acts of sabotage by fellow contestants. We also know that one team will be doomed to a first-episode departure, and the 42-year-old Kahler and the 41-year-old Yturralde did everything in their control-freak power to make sure they were not that team. So Yturralde memorized the routes in and out of major U.S. airports, and the duo combed travel Web sites to determine which international airports had the most delayed flights. A word of advice from Bill and Mark: Never go through London's Heathrow Airport if time is of the essence and prize money is at stake. But even with all their careful research, focused shopping and expert packing, the old friends encountered challenges they couldn't have anticipated. They can't say what those challenges were, of course. But they can say that the excitable, thrill-seeking Yturralde and the quieter, more methodical Kahler each rose to the occasion in his own special way. “I know a lot of very intelligent people, and Bill is hands down the smartest guy I know,” said Yturralde, a volunteer treasurer for the annual Comic-Con pop-culture convention and the principal technologist for Cardinal Health in San Diego. As for Kahler, an associate director for financial aid for a local law school, he was impressed with Yturralde's ability to win friends and influence almost anybody. The label Kahler and Yturralde got was “Best Friends,” and in spite of the commercial showing Mark slapping Bill upside the head, the label was not a lie. As far as we know. “Leading up to it, we thought, 'Could something happen that would make us so mad at each other that it would threaten our friendship?' ” Kahler said. “We've been through some stressful stuff when we worked on Comic-Con, but usually when something gets us mad, we get mad about it together. It never occurred to me that there could be anything that would just make us turn on each other. I am slow today...just found this one and was bringing it over too because it made me laugh. Remember Teri and the paper undies?? Found a board that you are posting on and thought I'd say congrats for finally getting on a show!!! Hope you had a great time! Jeff says "Hey there, Hi there, Ho there!" We're watching and keeping our fingers crossed for you two. I'm another "friend" of Mark's, known him for over 20 years and his luck is either very good or very bad...so since he made it through the first episode I'm hoping he makes it to the end!!! I like this team, I didn't think I would. Big thanks to Mark and Bill for including Chateau in their Ep 1 viewing party! From everything I hear, it was a great night and a super fun group to watch with as well... 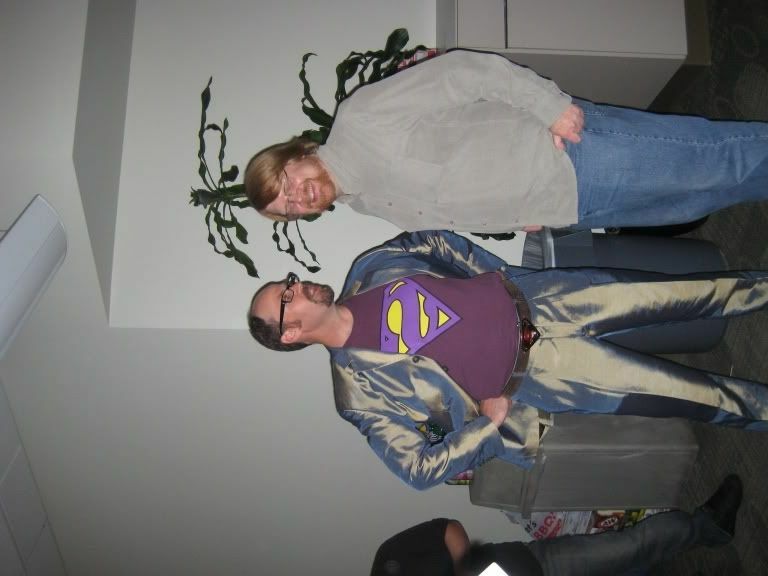 Especially after such a strong showing from our Geeky Dynamic Duo!! You guys are rocking the race and did so well, and you were fun to watch! I know that Kynt and Vyxsin had a blast, as you can also read here. Thanks Peach, I'm running slow today. Meeting Mark & Bill was fantastic. I got to meet their buddies and Mark's boss. One of their mom's even made Rice Krispey Treats for the event. It was in the company mess hall. Probably about 6x2x8 people in there. On explaining their absences to their friends and family, Mark had to fess up that he really was not traveling in China the whole time. Bill had a beautiful scheme to mask his absence from real life. He crafted it along the guideline that no part of the story was untrue. The first part was that a few years ago a friend had included him in a filming project somewhere far away (I'm missing his details here). And that now (as in last April) he has been contacted to do another filming project. And that for that new project there is a firm NDA so he could not provide details or contact information for when he was gone. Sweet. They were tight lipped about un-aired details. I get the impression there are some new strong rules in place about what they can discuss this season. I could tell that they really want to explain the leg but they always had to stop short when it ventured very much outside of what aired. I learned a lot about their shoes and backpacks. And there were trucks involved in the camping behind 19 BC! Probably to prevent anyone from sneaking off in the night to reserve a taxi for the morning! They are both a lot of fun and I hope we get to see more of them in show and at TARcon. Thanks for sharing Chateau! I'm so jealous ! 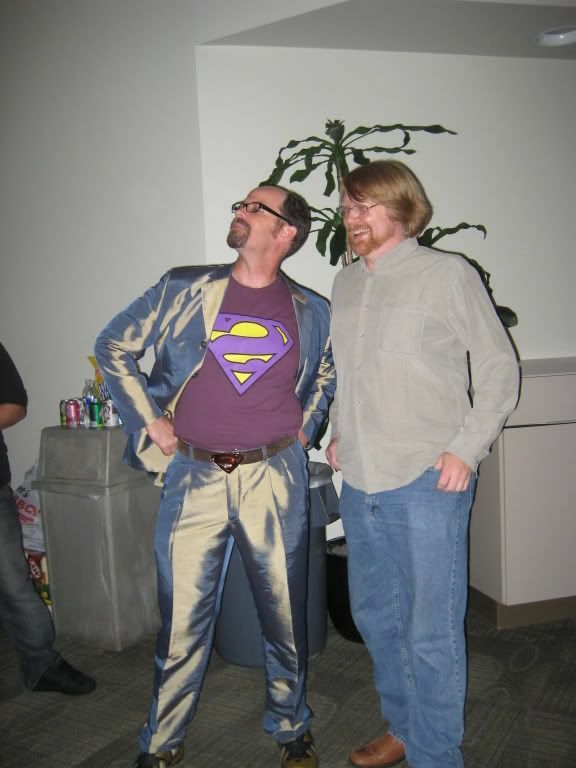 And the silver suit........ omg Mark you are a riot <3! I loved the insider clips as well as their chat with Phil at the mat, you can tell that Phil just love you guys and had a lot of fun with you all. I hope Mark doesn't mind ..........theres Chateau! Mark Yturralde and Bill Kahler's viewing party for the Amazing Race season 13 premier party! And yet another set! I see what you have Chateau and I want one too! Hi guys! My name is Lisa, and I'm another friend of Mark's (I took the 2nd set of pictures linked from the premiere party). I've only met Bill once, but I can say hands down that Mark is the smartest guy I know...and while he refuses to tell me for certain, I know in the very center of my being that these guys won. Mark is being extremely cautious to play by the rules, and I'm pretty sure it's because he wants to make sure they're asked back to an All Stars episode. They may have been out of shape during the show, but Mark has been training like crazy ever since...he's in the middle of a 100 mile bike race as I type this. I don't see it linked yet, but Mark and Bill set up an official site for the show at www.markandbill.tv, and I created a fan site at www.adorkablegeeks.com. The name is based off a phrase TV Guide used to describe them, but I may try fluttering my eyelashes at Mark next week to see if he'll trade me for amazinggeeks.com. The site is a tumblelog, meaning that it's all clips of content from around the web generated by or about them. Stuff like photos, videos, interviews, and every once in a while I can sneak in little details released by Mark and Bill themselves...like the fact that Bill taught himself Portuguese on the plane to Brazil, or that they were the only team who actually paid to ride the funicular in Episode 1. I'm also going to try to get my hands on stuff like the graphs they made when researching what shoes to wear. Puddin, I'm going to start linking a lot of your stuff on there, too. And here I thought *I* was combing through a lot of TAR content...you're amazing! Hi Adora, great to see you here too. I loved your shots of the party. Ooh, you've got the right brand, which is half the battle. But based on this image, I think the actual shoe is here (pretty much the same thing but blue). Good job! Thanks, Adora. I can't see the image you linked (no permission ). But here is the shot I was trying to match. The thing is that either shoe does not match the 9 oz that Mark claimed. So I was not sure. Hmm, try this link? http://www.flickr.com/photos/saldana/2887692599 Flickr might not let users who aren't logged in view original size images. Attaching a crop anyway. EDIT: Dude, you seriously got that close from THAT screenshot?? Welcome, Lisa. Glad you're here! I can't believe I missed that great still of them! Mark told me about Inov8 so that gave me a lead to follow. So are you going to start kidding him about Cholitas?